Peggy Seeger did not enjoy her first ever experience of the Cambridge Folk Festival. She played the inaugural event way back in 1965 and reflecting upon that occasion from the main stage this Saturday afternoon the veteran American folk singer and political campaigner recalls that the festival organisers “just didn’t quite have it together (then)”. But returning once more to the grounds of Cherry Hinton Hall – she was last here in 2015 – she is clearly thrilled at being back again. The festival has come a very long way since those embryonic days. Now in its 54th consecutive year, Cambridge Folk Festival has broadened its musical horizons in the interim to embrace all that is great in contemporary country, blues and roots music, whilst still remaining passionately true to its more traditional folk heart. But whilst the diverse quality of the music that the festival consistently presents year upon year is undoubtedly a most significant factor in it having since established such a strong reputation for itself – the event has once more sold out its entire ticket allocation in 2018 – the key to its continuing success surely lies in what is now its truly excellent organisation and delivery. At Cambridge Folk festival everything goes according to a very well-executed plan. OK, there was a slight delay ahead of Eliza Carthy and the Wayward Band’s set on Saturday evening due to some unforeseen technical hitch, but that aside I cannot recall one act that did not start – and finish – bang on time. And when you take account of the fact that this concerns more than 100 acts performing across the site’s five main stages, not to mention there being a whole range of panel discussions (including one on mental health in the music industry and another on women in music and the current challenges that they face within the industry), local folk club sessions, and assorted workshops (from songwriting to Northumbrian pipes, juggling and drawing) that are also taking place over the course of the festival’s four days, this is no mean feat. And all of this is achieved with a remarkably warm welcome and the creation of an excellent atmosphere with its heightened sense of inclusivity. It feels good to be here. Glorious sunshine greets us on Thursday and Britain’s prolonged heatwave continues unabated for the entire duration of the festival. As the temperatures soar, so does the music. The undoubted highlight of the first day is Drever, McCusker and Woomble. The three Scotsmen reunited to celebrate the 10th anniversary of their landmark album Before The Ruin and supported here on drums by fellow countryman Louis Abbott of Admiral Fallow it is to that record they first go with the beautiful ‘Into The Blue’. They also have time for Kris Drever and John McCusker to belt out a couple of jaunty jigs before revisiting Roddy Woomble’s 2006 solo offering My Secret Is My Silence with ‘Waverley Steps’ and the album’s stunning title track. There are far worse ways to spend a Friday afternoon than whiling away the hours round by Cherry Hinton’s duck pond. In that tranquil space, you can just lay back and watch the world go by whilst listening to the delightful strains of new and upcoming music emerging from The Den’s intimate marquee tent. Two young English singer-songwriters Ellie Dixon and Georgie are perfect examples of Cambridge Folk Festival’s continuing support of such rising talent. Each artist reveals a strong hand of their own material and like a number of other similar performers on this stage over the weekend they also treat us to a wonderful cover song. In Dixon’s case it is her impressive interpretation of Mark Ronson’s ‘Uptown Funk’, whilst Georgie opts for an equally compelling reading of The Ronettes’ ‘Be My Baby’. Over on the main stage we then get our first sighting of Rhiannon Giddens. It will not be our last. In addition to playing over the weekend – once with her full band on the main stage on Saturday evening, in what has to be the show-stopping performance of the entire festival, but also a few hours earlier in a ‘secret set’ on the second stage – she hosts a children’s workshop, leads the aforementioned discussion about women in the music industry, interviews Peggy Seeger and fully embraces her role as the festival’s guest curator. It is in this latter capacity that Giddens is now on stage to introduce one of her chosen acts, Peggy Seeger, who is the first of a string of strong and influential female artists personally selected by her (Kaia Kater, Birds of Chicago, Amythyst Kiah and Yola Carter are her other excellent choices). Accompanied by her son Calum MacColl, Peggy Seeger has rightly acquired the status as being one of the most powerful women in folk music, something to which a lifetime of fighting for truth, peace and social justice firmly attests. Now 83 years old, age has not withered her as she concludes her sparkling set with a brilliant, scathing acapella ditty about her country’s Commander-in-Chief. Accompanied here by Sam Sweeney (violin) and Ben Nicholls (upright bass), John Smith affirms his position as one of the foremost exponents of modern folk music. He may well sing about violence, heartbreak and love – the basic ingredients that are found in many a traditional folk song – but in his hands, they are transformed into something altogether new. ‘Hummingbird’, the title track from his forthcoming new album, and ‘Salty and Sweet’ showcase his exquisite, mercurial adaptation of such an established musical genre. Replete as it is with many a singer-songwriter and despite the captivating beauty of much of its music, Cambridge Folk Festival can often feel visually, at least, rather one-dimensional. Eliza Carthy changes all of that. With her shock of blue hair and matching streak smeared across her eyes the celebrated North Yorkshire folk revivalist is prepared for battle. She is a blur of colour, vitality and unbridled energy as she leads her big band through a stirring set of traditional tunes. Late Friday night presents us with a dilemma faced at many a music festival, that of the dreaded “band clash” where two acts appear at virtually the same time on different stages. Tonight it almost becomes a straight choice between First Aid Kit and Roseanne Cash, but a slight staggering of the stage times enables us to catch the first couple of songs of the country singer’s set. Appearing with her husband and collaborator, John Leventhal, Cash is sheer country class. The securing of First Aid Kit as one of their headliners represents something of a coup for Cambridge Folk and emphasises not only the festival’s ever-increasing musical reach but also its strong commitment to powerful female performers. And the Söderberg siblings do not disappoint. They glide through a mighty set that carefully balances material from their latest album Ruins against older songs like the imperious ‘Emmylou’ and ‘The Lion’s Roar’ and a superb cover of Kate Bush’s ‘Running Up That Hill’. East London’s Stick In The Wheel kick-start Saturday on the main stage and provide an immediate link to both Peggy Seeger and a veritable folk music past through their rendition of her former husband Euan MacColl’s ‘Champion At Keeping Them Rolling’. It seems almost natural that songs about enclosure, modern-day witch bottles, naughty sailors and ‘The Abbots Bromley Horn Dance’ (complete with plastic recorder) should then follow. Two years ago Darlingside proved to be one of the great successes of the 52nd Cambridge Folk Festival, stepping in as they did at the very last minute to replace the then ailing soul legend Charles Bradley on the main stage. This year they are there in their very own right and once more enthral us with their impeccable four-part harmonies. All huddled round the one microphone, a stunning cover of Neil Young’s ‘Red Sun’, a stratospheric ‘Blow The House Down’ and a wonderfully poignant ‘The God of Loss’ have to be the three greatest, consecutive songs of the entire festival. The appearance of Darlingside, who had only just arrived in this country after playing at the Newport Folk Festival in Rhode Island, illustrated the fact that Cambridge is now twinned with that other, most venerable of folk festivals, further confirming its worldwide renown. The area around The Den – a delightful haven of wildlife, nature, paddling children, ice creams and drawing classes – once more provides a welcome retreat from the general hubbub surrounding the two main music stages. It also offers the chance to catch first Smith & Brewer and then Zoё Wren. The former are Ben Smith and Jimmy Brewer, a most personable and hugely talented Americana guitar duo; the latter a young English singer-songwriter whose quietly understated confidence comes from her day job as a busker on the London Underground. Rhiannon Giddens is an absolute delight. Her songs break down barriers, both socially and musically and are carried aloft by the sheer weight of her versatile talent and huge personality. Her message may well be one of fierce defiance against the continuing discrimination and injustice she sees in the outside world, but it is delivered with such huge warmth and humanity. Giddens’ unaccompanied version of ‘Pretty Saro’ is absolutely breathtaking; on ‘Waterboy’ she turns her hand effortlessly to ragtime; for ‘Underneath The Harlem Moon’ she proves herself to be equally adept at singing the blues; and country music is no barrier to her as she takes temporary ownership of Patsy Cline’s ’She’s Got You’. Having seen Patti Smith on numerous occasions recently, I opted to forego her in favour of John Moreland. It proves to be a very wise move. The man from Tulsa, along with superb sideman John Calvin Abney, is an absolute revelation. Bridging a desolate gap that exists somewhere between Steve Earle and Nebraska-period Bruce Springsteen, he seams a deep, harrowing well of despair. ‘Gospel’ and ‘You Don’t Care Enough For Me To Cry’ are genuinely heartbreaking. But for all of the despondence that lies at the heart of many of his songs, Moreland instils in the listener a great sense of hope. We head back to Coldham’s Common (the second festival campsite, about two miles away from Cherry Hinton Hall) with the strains of ‘Because The Night’ filling the night air. Because the night belongs to… John Moreland. The Fellow Pynins – the American duo of Dani Aubert and Ian Van Ornum – breathe idiosyncratic life into Sunday afternoon with their most pleasing songs about underground railroads, a horse’s view of the world, and the general quirkiness of life. And we just had to check out the Australian singer-songwriter, William Crighton, a man who has drawn artistic comparisons to Tom Waits and Nick Cave. And for once such similarities are not wildly overblown. Making his first-ever appearance in this country and joined by Matt Sherrod on drums (Sherrod produced Crighton’s latest album Empire) – but without his brother who would have otherwise been there on bass “but wasn’t allowed into this country” – there is an unsettling intensity about William Crighton and his music. He stalks the stage like some caged animal armed with a hatful of songs that brim with passion, fury and the experience of growing up in Wagga Wagga, New South Wales. His potency spills right over during ‘The Band Played Waltzing Matilda’ as it bleeds uncontrollably into ‘Fire In The Empire’. Returning Cambridge regular Kate Rusby produces her customary charming performance, one further enhanced by the appearances of the Scots musician Lori Watson (who brought with her a wee bit of the Scottish Borders) and her fellow countrywoman Eddi Reader who sang ‘Maiden’s Lament’, an old song she had found in her grandfather’s chest. All three women came back together for an enchanting ‘Blooming Heather’ before Rusby returns to encore with a rousing ‘Big Brave Bill’ and a suitably complementary ‘Underneath The Stars’. And so it is then left to two American cultural heavyweights to bring to a fitting close what has undoubtedly been one of the most musically enjoyable and personally satisfying Cambridge Folk Festivals in recent years. Janis Ian still dreams of creating that one shining moment that will break down barriers and eclipse all artistic achievement. In truth, she has probably already attained aesthetic immortality through ‘At Seventeen’. Released in 1975, it is not until you hear it again – performed here by Ian as if she were playing it for the very first time – that you realise just what a perfect popular song it really is. 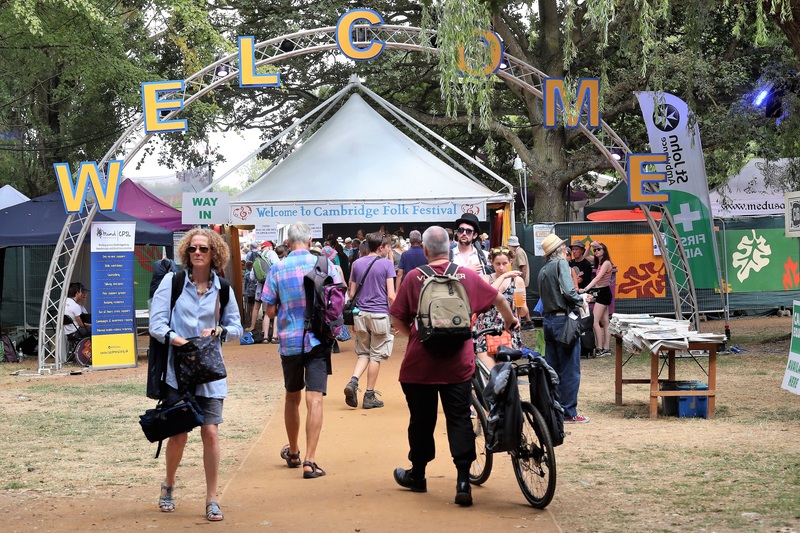 The 54th Cambridge Folk Festival was held at Cherry Hinton Hall, Cambridge, England between the 2nd and 5th of August 2018.